It’s so hot outside this weekend which means it’s fro-yo time in our house. 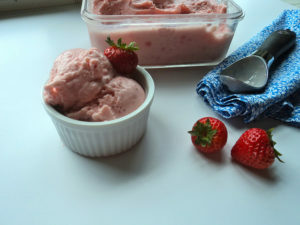 I love making frozen yogurt at home because it’s super simple, and I know what is in it. This recipe actually makes a pretty healthy treat–loaded with protein and antioxidants. These were the only ingredients I used..and let me tell you, it makes a delicious combo for a frozen snack. 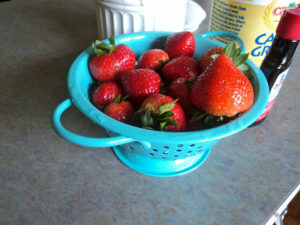 The strawberries were bursting with juices. Pulverize them in the blender. 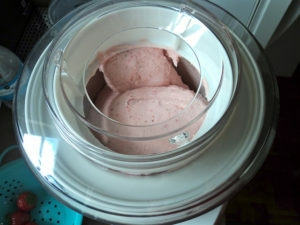 Pour into ice cream maker until it’s almost frozen, and resembles soft serve. Freeze a little more in the freezer. 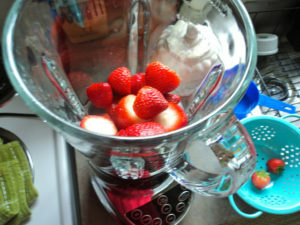 Pulse strawberries in a blender, just until blended. 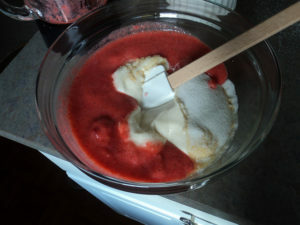 Mix all ingredients together and pour into ice cream maker, and mix until resembles soft serve (about 15-20 mins in my maker). 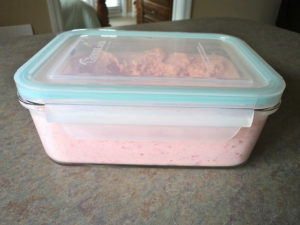 Place in freezer to finish freezing. PS. May need to let thaw for about 5 min before serving after frozen in freezer. 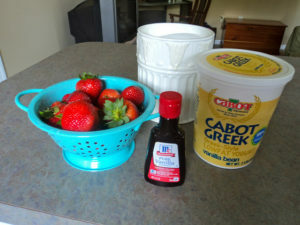 I’m so excited to be posting this blog with the Recipe Redux. We are a group of bloggers that create recipes with nutritional benefits to give healthy alternatives to old school recipes. 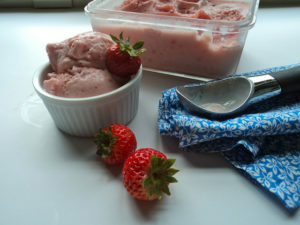 Check out these other cool blogs to see what frozen treats they are enjoying. Perfect for the cookouts this weekend! This looks delicious! 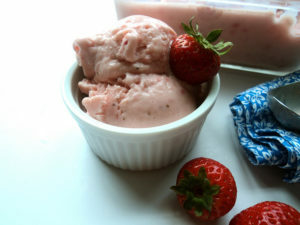 Love any excuse ro use my ice cream maker :-). This looks so delicious and refreshing! Perfect for summertime! So simple yet so delicious! What a refreshing treat! First of all, I love your photos! Second of all, I can’t believe the simplicity of your recipe. It looks healthy and delicious (a perfect combo)! What ice-cream maker is that? I want to see if I can get in Australia. Beautiful photography. Mmm I think I have the same ice cream maker as you. Isn’t it the best?! Very nice photos. I like that your recipe is simple with minimal number of ingredients. Glad to connect through Recipe Redux!